The Bug-Eyed Crawmad (デメジャコ?, lit. 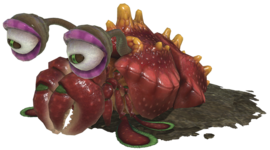 : "Bug-Eyed Mantis Shrimp", Bugeyed Crawmad in the European version) is a miniboss that appears in Pikmin 3, twice in story mode and both times in the Garden of Hope. Its appearance is similar to the Hermit Crawmad, but it possesses distinctly large eyes protruding out of its head through eye-stalks. Instead of appearing from only one hole in the ground, it can switch between two different holes. It resembles stout lobster or shrimp-like crustaceans whose claws resemble those of squillas but are in fact related to hermit crabs. The enemy sits in its burrow and is usually found around watery areas, although it can survive on dry land as well. It will peek out of its hole when prey – such as Pikmin – approach it. If a Pikmin or leader gets too close to its dwelling, the Crawmad will attack. It attacks by charging out of its hole and grabbing prey (up to ten Pikmin at once), almost instantly devouring them. The only way to damage this enemy is to hit its eyes. Once they are both significantly damaged, it will flip over exposing its raw underbelly. Despite being one of the largest bosses in the game, it takes only twelve Pikmin to carry. On the main Story Mode, they're both found in the Garden of Hope. One of them is in a cave that contains an elevator platform puzzle, Dusk Pustules and some Hermit Crawmads. This cave is located behind two electric gates, located to the east of the Garden. The other one can be found on the half of the area where Blue Pikmin are found, to the Northwest of the path leading to the Quaggled Mireclops's arena. This Crawmad is located near the north pile of fragments that can be built into the tea cup, above water. In Mission Mode, one appears in the Collect treasure! variant of the Fortress of Festivity. It releases 4 Cupid's Grenades when defeated and is worth 100 Pokos. Another appears in the Battle enemies! version of Forgotten Cove. It's behind a dirt wall, and killing it gives the player 100 points. Both of these enemies are considerably weaker than the ones encountered in Story Mode. Finally, one also appears in the Bingo Battle stage Twisted Cavern. As an eye is attacked, it turns redder and eventually retracts. If both eyes are taken out before the Crawmad retreats into its hole, it will flip over, revealing its soft underbelly. After some seconds, it will flip back upright and the cycle restarts. Repeat the process if needed to defeat the beast. With thrown Pikmin, manual cursor aiming may be needed, but Winged Pikmin can charge the eyes instead of the body. Rock Pikmin deal good damage when thrown directly onto the eyes as well. Bomb rocks may be used to instantly take out one eye, or both at once, immediately flipping the creature onto its back. Alternately, if one is ingested by the creature, it will cause it to take a sufficient amount of damage and flip over. Winged Pikmin can take this mini-boss out in just a few seconds. Bring 100 of them out to fight it, preferably flowers, but the result shouldn't matter too much. Once the Bug-Eyed Crawmad is vulnerable, just lock onto one of the eyes and swarm it. The Winged Pikmin take out the eyes very quickly, and once one eye is down they will attack the other – either that or they will attack both at once. Once it flips over, don't do anything, as the Winged Pikmin will be above the body and will take that out very quickly too. This strategy becomes even more efficient when combined with an ultra-spicy spray, given its improvement in attack power for Winged Pikmin. The Bug-Eyed Crawmad is called such because of its protruding eyes – creatures like this are often called "bug-eyed". In UK English, the word "bug-eyed" is "bugeyed", so the European and Oceanic releases of the game call the creature "Bugeyed Crawmad". In Japan, it is called デメジャコ?, where デメ? means "bug-eyed", and ジャコ? is very similar to シャコ?, or "mantis shrimp". Internally, this creature is called demejako, which is a Romanization of its Japanese name. A frontal, detailed view of the creature as it prepares its assault. The Bug-Eyed Crawmad's full body can be seen here. A Bug-Eyed Crawmad confronting Brittany and Charlie. A Stellar Extrusion next to a Bug-Eyed Crawmad in the Garden of Hope. The Bug-Eyed Crawmad found in the Fortress of Festivity. The data file for the Bug-Eyed Crawmad in the European version. This page was last edited on January 13, 2019, at 12:12.